When you think of hexcrawl map generating, you probably don't think of Central Casting: Dungeons, by Robert Sassone. There are no hexcrawl procedures described in the book. However, there is a method for generating the details of the area around a dungeon created with the Central Casting tables. The method involves four tables, each designed around a pair of qualities: flat vs. mountainous, dry vs. wet, low vs. high elevation, cold vs. hot climate. Elevation here refers to both the height of the dungeon entrance relative to the ground and the general elevation of the terrain. Wetness governs not only the simple presence or absence of water, but the lushness of the vegetation. When using this to generate terrain on a hex-by-hex basis, I would recommend only rolling once for climate for a large area, and possibly only once for elevation. For wetness, I recommend rolling two or optionally three times at corners of the map, to establish a gradient of change in wetness. This could be done for elevation, too, although I didn't do that for the test map. This leaves only one roll per hex for the shape of the land. Use the elevation and wetness qualities to decide which flat areas are marshes or swamps; use the wetness in general to decide how thick the vegetation is in a hex. Pros: Combined info from all four rolls results in reasonable variation. With the suggested changes, there's some logic to vegetation and elevation. 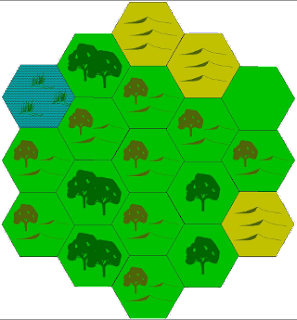 Cons: general terrain isn't affected by terrain in adjacent hexes. Tables are of the clunky/slow variety. Thanks for this series of reviews of hexcrawl systems. I've been looking at some of them for a while now, but have no frame of reference for using them. Thanks! This one's the last review, since I don't know any other free ones offhand, and did all the commercial ones I had access to. Tomorrow I'm posting some conclusions/thoughts, and then I'll put together my own hexcrawl system.